You will recall the hubbub created in London (and elsewhere) by the Young British Artists in the late 1980s and ’90s–led by Damien Hirst and including Tracey Emin, Sarah Lucas, Gary Hume, Fiona Rae, and Steve Park, among others, they rebelled against the art world’s customs. 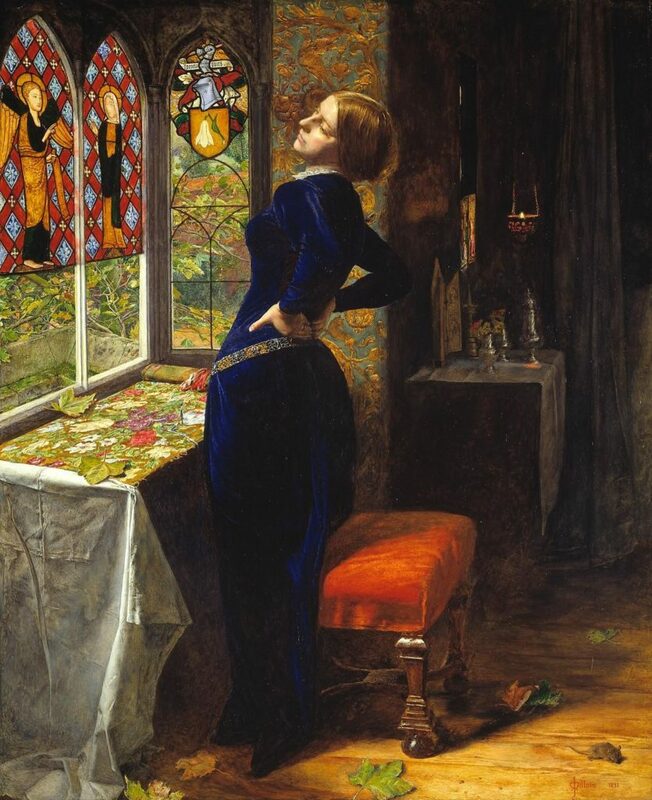 Their 19th Century counterparts were, of course, the Pre-Raphaelite Brotherhood, led by Dante Gabriel Rossetti, William Holman Hunt and John Everett Millais. They too spurned art of their times, but instead of looking forward they looked back to the Old masters for inspiration. What’s new about that? Nothing, really, except that for the first time a museum–the Legion of Honor of the Fine Arts Museums of San Francisco–has in a major way lined up works by Pre-Raphaelites with works by Old Masters like Botticelli, van Eyck, Memling, Veronese and Raphael himself. Intent on creating something novel, they nevertheless looked back to myth and medieval literature for subject matter or sometimes simply invented nostalgic scenes, filling their paintings with symbols and hoping they would be read like books. They believed in observing nature but sometimes depicted it in unnatural colors and flattened surfaces. In tune with their name, they sought to return to the practices of artists who preceded Raphael (1483-1520), but they actually esteemed him, giving him a place on their list of “Immortals” along with Michelangelo, Fra Angelico and Leonardo da Vinci. It was the saccharine, postured images of Raphael’s followers that riled the Brotherhood, yet they sometimes made sweet, overripe paintings themselves; and they eventually came to emulate the lush, stirring works of many Italians who came after Raphael, like Veronese. I don’t know how the YBAs will fare in the years to come, but the PRB, we know, are kind of niche artists today. Some people love them; most people who call themselves art aficionados don’t love them–many actively dislike them. There’s probably a lesson there about looking backward to make something new–that’s rarely done in a way that lasts. It wasn’t long after the PRB formed that French artists staged their own rebellion against the academy, but they came up with Impressionism, and later Fauvism, and Cubism, and…well, you know how that story continues. The PRB, I think, ended up influencing the world of design more than the world of art. If you’re curious, there’s an “in-depth” portion of the museum’s website also devoted to the exhibition (with more pictures). The WSJ has more paintings on its website too. 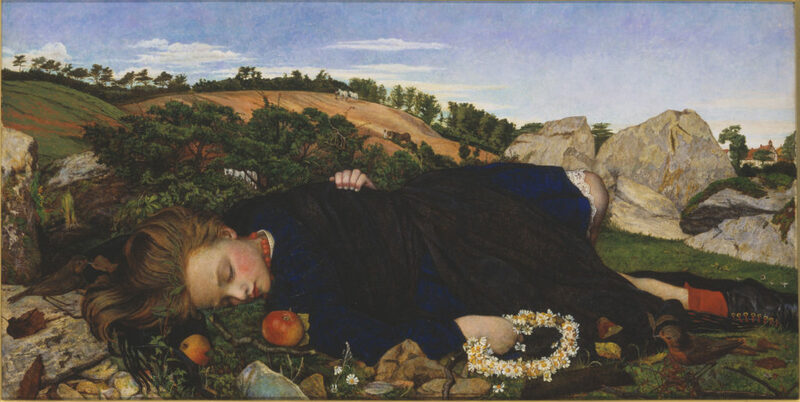 Above right is Millais’s Mariana and at left is a somewhat strange but intriguing work by John Roddam Spencer Stanhope called Robin of Modern Times, from the collection of Gordon and Ann Getty. 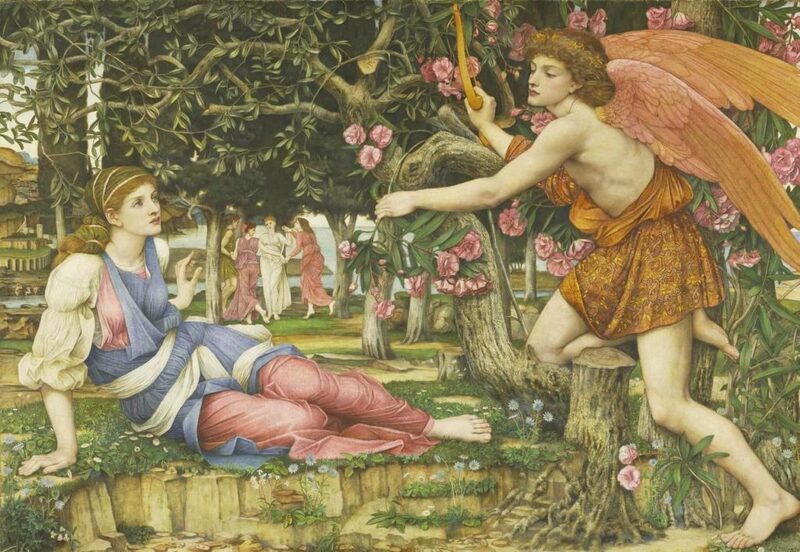 Below is Stanhope’s Love and the Maiden.